This is my ring stock listing, that contains only ring types that are CURRENTLY stored here, for own use, but also for sale. And it contains only rings, that are sawcut Bright Aluminium or Bronze, that are tumble-polished after cutting to a shiny, mostly burr-less finish. I won't sell unpolished stuff. If you want to order rings, either contact me via facebook message/chat - Heinrich Zinndorf-Linker, or per eMail to maille-order@zili.de. Payments are possible via bank transfer (European Union only), or via PayPal. Details will be told while chatting or per eMail. - Please note the Material info page. If you see zero-amounts listed, I either ran out of the ring type, or just plan to stock it - people who tend to order by final ring data may find the (here predicted) data useful. If you wonder why I have sometimes multiple same-nominal ring types listed: This is due to the fact, that these rings were produced as different batches, at different times, or from different wire batches or types. As different wires often differ in hardness, they can have slightly different final data. Being somewhat perfectionistic, I don't mix these batches, but list them separately, even if the difference is so minor, that it would not matter in application for most maille projects. And different wire batches sometimes differ in achieveable shine, so while the size differences wouldn't matter, it could be visible. If you want to order something, please specify CLEARLY, whether you want to order by nominal (mandrel based), or by finally achieved (or to be approached) ring data. If I don't get this info, I assume nominal mandrel based data are asked for. Else it's no problem for me to select the proper ring storage bag, if you give me the listed Batch number, once more than one batch of a particular size exists. But it's usually not even a problem, if you ask for the combination wire diameter and AR, and I'll find the proper ring bag (or mandrel to make such a ring type, or at least approach needed ring data as close as technically possible). And it's not necessary to order in multiples of a thousand - lower (and naturally larger :) amounts are acceptable, as well as ordering by weight; I'll be able to do the maths... In case there's need for more than the currently stocked numbers of a particular ring size, amounts of up to a couple ten thousands can be produced on short notice. Other, not (yet) produced and listed ring types can also be made on demand, e.g. 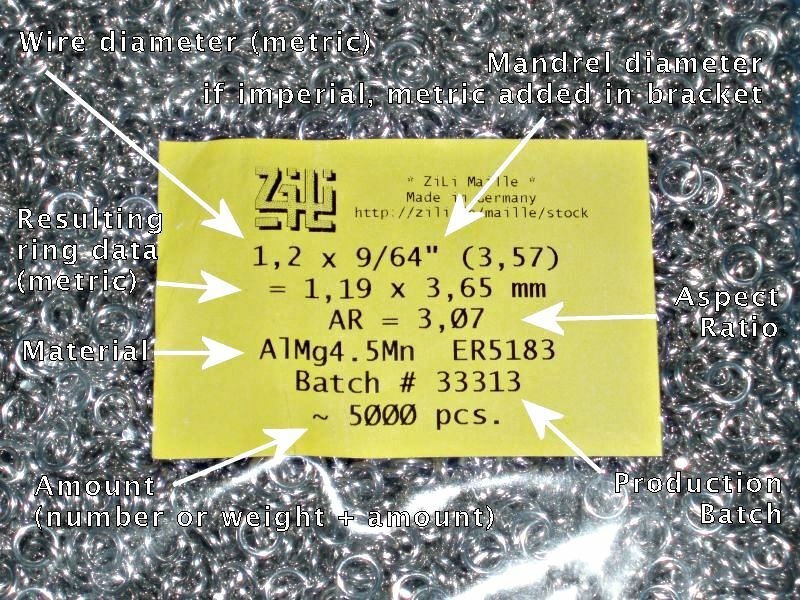 on US drill rod sized mandrels, to achieve a particular Aspect Ratio for a given wire diameter. In these cases I might be forced to charge an extra 10%, if I have these mandrels only in 'stubby' lengths, so the coil end material losses and especially my workload are simply higher. See my mandrel selection table to see, what is available (I lack only some of the very thick or very thin mandrels listed there).